Shiny beacon of loveliness. Woolwich Equitable’s signage is suitably retro. Blimey. It’s just dawned on me that I haven’t strayed from SE18 for the entire weekend. In fact, I haven’t even left Woolwich. Thing is, I haven’t really felt the need to. 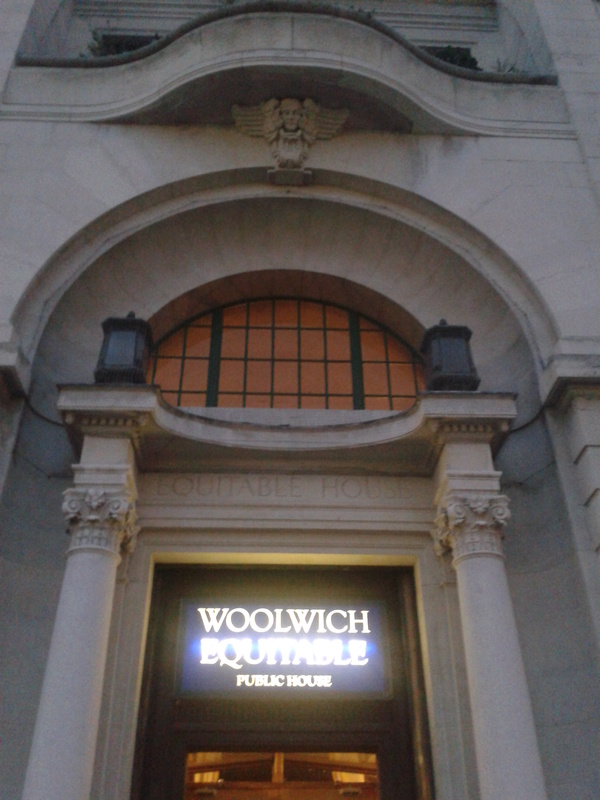 Friday night: a couple of snifters at the sparklingly new Woolwich Equitable. Not quite packed to the rafters but a decent crowd and a convivial atmosphere. When the kitchen opens, I’ll simply get all my mail redirected and move in (I practically have already). Then, over the road to help James and Emma and the Hopstuff team celebrate their first birthday. Boy, can those kids organise a piss-up in a brewery: the place was heaving. I got slightly emoshe talking to Emma. I’m just so bloody proud of them and the difference they’ve made to SE18. Sniff sniff. Silly ole me. Saturday morning: a slightly sluggish start (I really can’t imagine why) followed by a restorative brunch at Koffees and Kream. The splendid chicken shish is my new default menu choice. 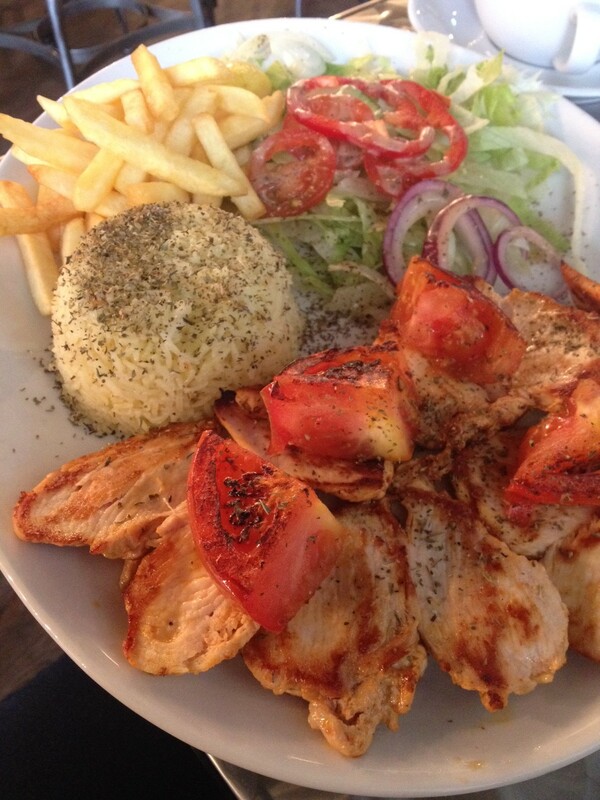 Tasty slices of grilled chicken and tomato are served with herbed rice (or chips) and salad. Saturday afternoon: drinks, as if more were needed, and early dinner in Dial Arch. I am unashamedly infatuated with the Woolwich Equitable, but I can’t forget that Dial Arch was one of the pioneers of Woolwich’s resurgence. On a bleak January day in 2011, having been in the U.K. for about 6 hours, I walked into it. I ordered a fish finger sandwich and a glass of coke and thought: yes, I can live in this Woolwich if this pub is to be my local. It remains to be seen whether DA will tweak its offerings (and prices) when the Equitable kitchen opens. I doubt it will get cheaper. There’s a studio flat in Waterfront 1 on the market for £392,000. Whoever buys that and moves in isn’t going to quibble about the price of a pint. Saturday evening: Go on, guess. Yes, yes. We crossed back over the Big Road and snuggled ourselves into the wood-panelled Office in the WE. According to the floorplan in the Survey of London’s volume on Woolwich, this charming little snug was originally a waiting room. Back when banks had waiting rooms. Sunday: after another inexplicably slow start, a typically delightful brunch at Cornerstone. Superb eggs benedict, followed by a saunter along the river. Actually, we did leave the postcode momentarily. We hopped on the ferry and walked along the river path on the North Woolwich side, admiring our Woolwich from a distance before scuttling back through the now-quite-clean foot tunnel. Chicken Shish at Koffees and Kream. Yum! I guess my point is that spending a whole weekend in Woolwich is now a very pleasant prospect indeed. And it’s only going to get better. I’ve heard that a Geronimo pub will open in 2015, in the building just inside the increasingly porous Arsenal walls. And An, the little Vietnamese joint, is moving to a nearby two-level premises that mercifully features a loo or two. They’re also applying for a liquor license. That’s great news. If they can get the lighting right, An will surely move up my hit parade of Woolwich eateries. All those smiley-faced white-toothed billboards around the Crossrail site promising 21 minutes to Bond Street are fine. It will be exciting. But, equally, I reckon Crossrail billboards elsewhere should be boasting 21 minutes to Woolwich. Fanciful notion? Now, yes. In 2018? Woolwich as a destination? Meanwhile, I’ll see you in my office. Me too, Friday night at Woolwich Equitable and then a momo or two at Kailash.